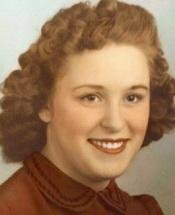 WATERLOO - Dorothy Bernice Stanhope Bass, 84, of Waterloo, died Friday, Dec. 4, at Covenant Medical Center of natural causes. She was born April 4, 1925, in Orange Township, daughter of Edward and Irene Anderson Stanhope. She married Robert R. Bass on April 12, 1947, in Galena, Ill. He died April 9, 1998, in Waterloo. Mrs. Bass graduated from Waterloo East High School and had worked as an assistant to the Black Hawk County auditor, retiring from that position in 1995. Survived by: a son, Douglas of Waterloo; three brothers, Edward (Patricia) and Gary Stanhope, both of Waterloo, and Harold (Jenny) Stanhope of Janesville; and a sister-in-law, Mary Stanhope of Janesville. Preceded in death by: her parents; three sisters, Verna Stanton, Marge Snotgrass and Janet Moore; and a brother, Faye Stanhope. Services: 10:30 a.m. Tuesday at Parrott & Wood Chapel of Memories, an Overton Family Service, preceded by an hour of visitation. Burial will be in Garden of Memories Cemetery. Dorothy was an avid gardener and an artist.